Congratulations to the ACS Reaction Mechanisms Conference poster prize winners! 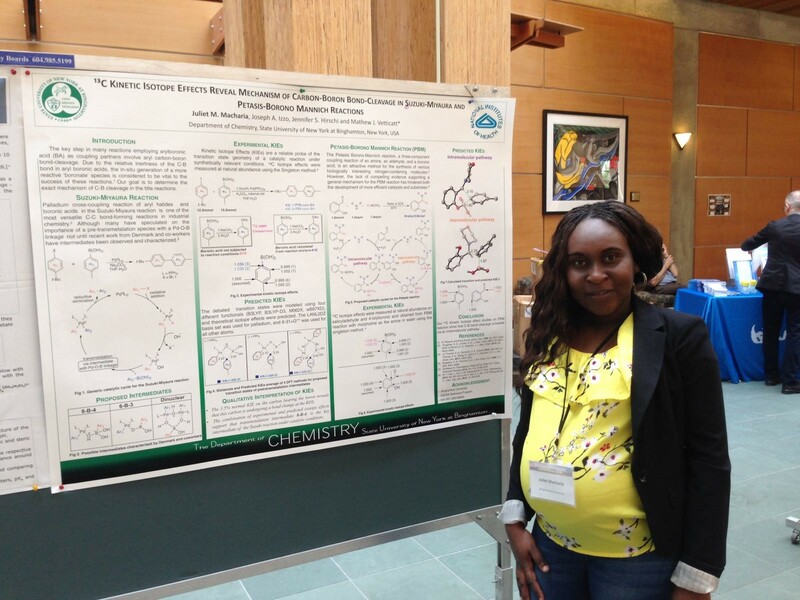 We want to say congratulations to the winners of the RSC poster prizes at the recent ACS Reaction Mechanisms Conference, hosted by University of British Columbia in Vancouver, Canada! Juliet’s current research focuses on the chemistry of a class of compounds called “arylboronic acids”. These molecules are widely used in fine chemical, pharmaceutical, agrochemical, and modern-material industries due to their stability, easy preparation and environmental benign nature. The key step in many reactions employing arylboronic acids involves carbon-boron (C-B) bond cleavage. Due to the relative inertness of the C-B bond, the in-situ generation of a more reactive ‘boronate’ species is considered to be vital to the success of these reactions. Her goal is to determine the exact mechanism of C-B cleavage in reactions using a physical organic tool, Kinetic Isotope Effects (KIEs) at natural abundance. In the future, she will utilize the mechanistic information from these studies for the rational design and development of new catalytic processes. Anna Lo, who works with Professor Jared Shaw at UC Davis, was the winner of the Organic & Biomolecular Chemistry prize. She says that she decided to pursue a career in chemistry to take advantage of the creative thinking and liberty in the practice of organic synthesis. Anna’s work focuses on two goals: (1) to elucidate conditions that provide reliable selectivity for additions to a-chiral imines, (2) to develop a mechanistic rationale for the deviating selectivity trends her research group observes. Stereoelectronic models such as the Felkin-Ahn model and Cram’s rules have been used as powerful tools in the asymmetric synthesis of complex synthetic targets. Due to their robust utility, Felkin-control and chelation-control have been generalized to imine stereocontrol, despite fundamental differences in reactivity between N-substituted imines and their carbonyl analogues. Recent work has illuminated a class of a-chiral aldehyde derived imines that deviate from previously well-established stereoelectronic models. This illuminated a gap in understanding of existing stereocontrol models, specifically when applied to N-substituted imines, which Anna is now investigating. This conference sounds like it was a great event, and we’re glad to support young researchers as they build their careers! Congratulations Alberta Nano Research Symposium! 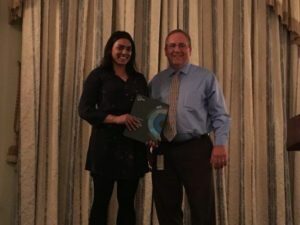 For the fifth year running, the University of Alberta and the University of Calgary Nano Groups co-organized the two-day Alberta Nano Research Symposium. The symposium provides a platform for showcasing innovation in nanotechnology research done in Alberta, as well as fostering deeper connections among researchers in academia and industry. 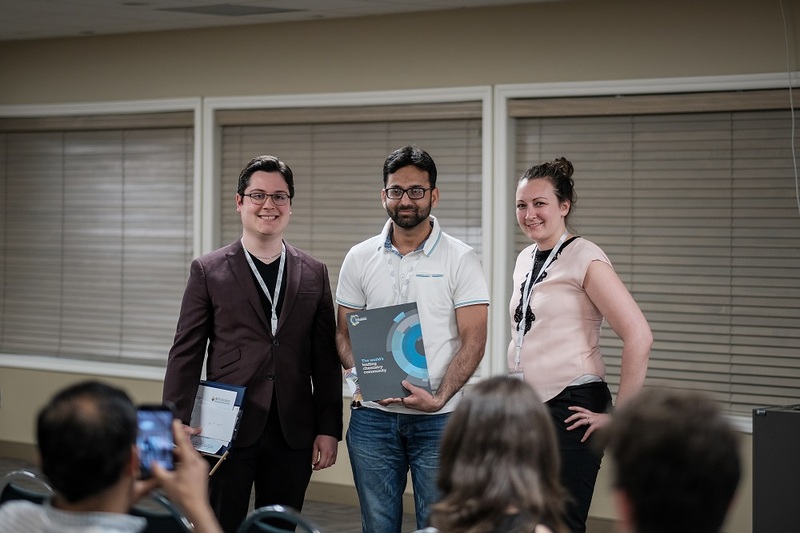 Students from across Alberta in all nanotechnology disciplines were invited to present their research, with prizes awarded to the top oral and poster presentations. Plenary speakers – leaders in nanotechnology – from Alberta, British Columbia and Saskatchewan were invited to give talks on some of their latest work. A poster session and a networking event brought together the community in the evening. Special congratulations to Muhammad Zubair, who won the RSC Nanoscale Horizons Poster Award. He presented a poster about the development of a novel membrane based on chicken feathers/graphene oxide for water purification. In Canada, approximately 100,000 tons of poultry feathers are produced every year, and most of them are landfilled or burnt. He is using these chicken feathers to make membranes for water purification, which will not only help to reduce the environmental pollution related to chicken feathers but also bring a new and low-cost solution to existing water purification membranes. The RSC is particularly enthusiastic about supporting the efforts early career researchers, so we want to say congrats for a successful event! Nanoscale Horizons Poster Award winner Muhammad Zubair (center), with Nicolas Macia (L) and Alyx Aarbo (R), co-chairs of the Symposium. Photo credit: Vladimir Kabanov. The Centre Québécois sur les Matériaux Fonctionnels/Quebec Center for Advanced Materials recently held its annual meeting in Montreal, and we were pleased to sponsor poster prizes from Analyst and Materials Horizons at the event. Congratulations to winners Nicolas Zindy from Laval University and Régis Imbeault from the University of Sherbrooke! Régis won the Analyst prize for his poster describing the development of high performance functionalized polynorbornenes (PBBEs) from simple, inexpensive and environmentally friendly synthesis procedures. Because of their very high physicochemical properties and their low anticipated cost, these new materials can compete with many commercial products, while offering a greener alternative and bringing new solutions for advanced applications. 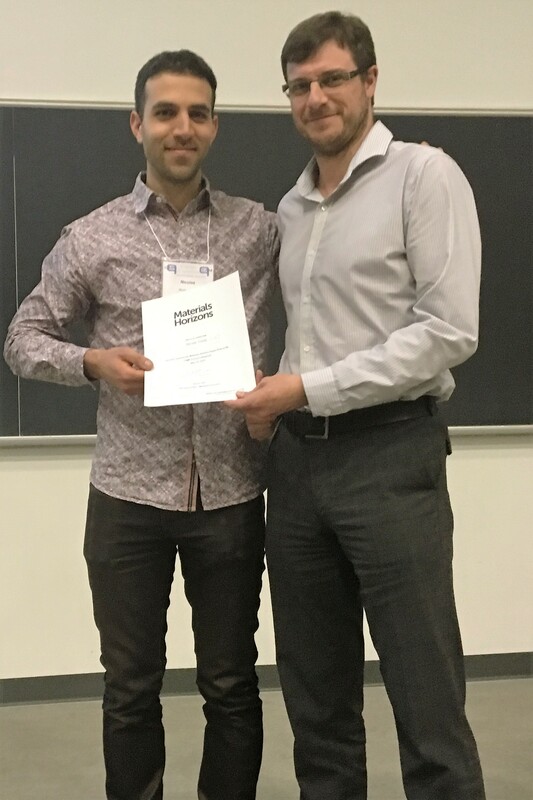 Nicolas won the Materials Horizons prize for his poster that presented a new strategy to create a pi-conjugated polymer using pyromelltic diimide (PMDI) as an aromatic C-H bond bearer for direct heteroarylation polymerization (DHAP) with 1,4-dibromobenzene. This material has been difficult to synthesize with conventional methods such as Suzuki or Stille couplings and has potential to be used as a cost-effective active material in next generation Li-ion batteries. Editors from two of our journals also took the initiative to present their advice on publishing, following our Meet the Editor format. Thank you Profs Jean-François Masson from Analyst and Federico Rosei from Journal of Materials Chemistry C for helping us educate the community about good publishing practice! The British Council is an organization in the UK that promotes cultural relations and educational opportunities in countries around the world. 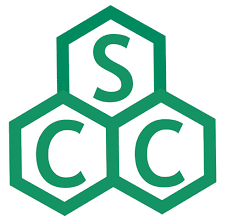 Three years ago, the RSC began collaborating with them on their Researcher Connect program. 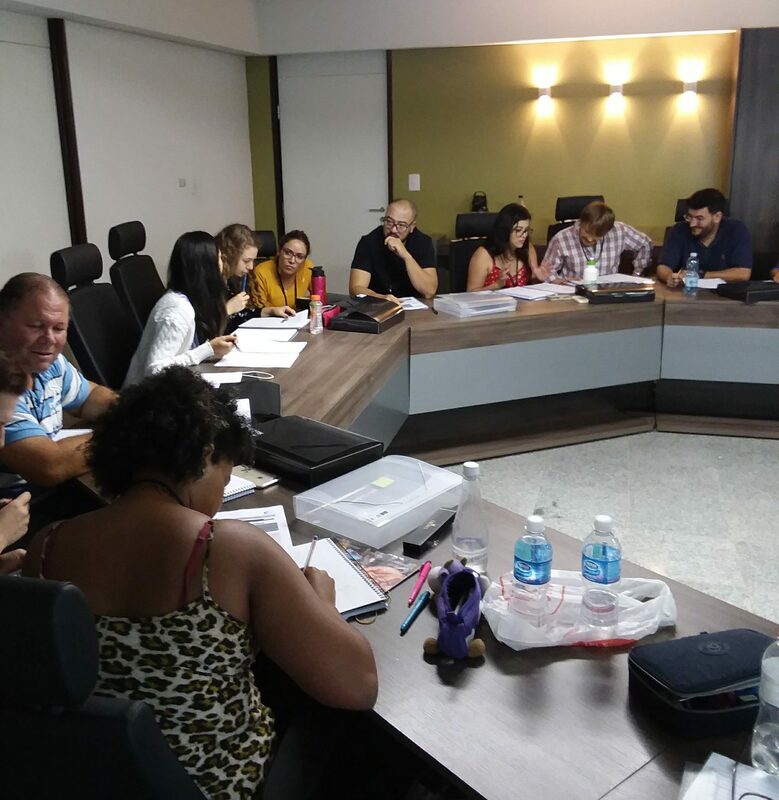 Researcher Connect brings workshops on communication skills to universities around the world, including Brazil. For our part of the program, we conduct 1-day, science communication focused workshops, which we call Science Connect. If you think your university in Brazil might be interested, the British Council will be putting out a new call for Researcher Connect applications starting April 2 2018 here. We will be selecting a few institutions chosen for the main Researcher Connect 2018 program to also host an extra day for Science Connect. This year, we held our Science Connect workshops at three universities: Universidade Federal do Espírito Santo (UFES), Universidade de Brasília (UnB) and Universidade de São Paulo (USP). We had students, postdocs and professors from not only chemistry departments, but also related fields such as materials science, molecular biology and environmental science. First, Elizabeth Magalhaes from our São Paulo office gave a presentation about the publishing process, with tips from our Editors about all stages of the process, from submission to revision. She also covered best practices for reviewing articles and ethics. The participants told us they found it really useful with lots of tips and good advice on how the publishing process works from the Editors’ perspective. Then, our first hands-on module started with students reading the text of an RSC Advances article from which we’d removed the title and abstract. After giving them some instruction on the essential components of abstracts and titles, we asked them to work in groups to first write an abstract for the article and then a title. Some of the students found this challenging because it was outside of their field, but many of their results included elements that could have improved the real abstract! Students at UnB collaborate to write an abstract for the RSC Advances article. The second module focused on communicating your research orally. We went over how important body language and manner of speaking can be. We looked at a real example and asked them to critique the speaker based on what they’d learned. The second half of this module focused on elevator pitches, which are generally unfamiliar to Brazilian researchers. With a worksheet as guidance, we walked them through the elements of a good pitch and asked them to take a stab at writing their own. Several of the students said they found this really useful because they hadn’t really sat down and thought about what they do and why it’s valuable to others. And finally, and most fun, we looked at the elements of great poster design. We showed some real life examples and asked the students to point out the good and bad elements. 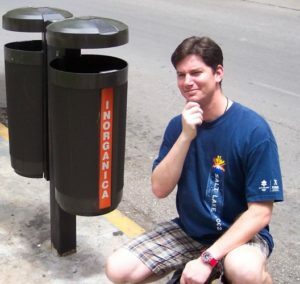 We emphasized that communicating your science in a logical way is the most important aspect of posters – they don’t always have to follow the same format as a paper. We encouraged them to get creative (but not too creative!) in thinking about the best way to visually communicate their science. Then some brave students allowed us to look at their real posters for friendly critique. 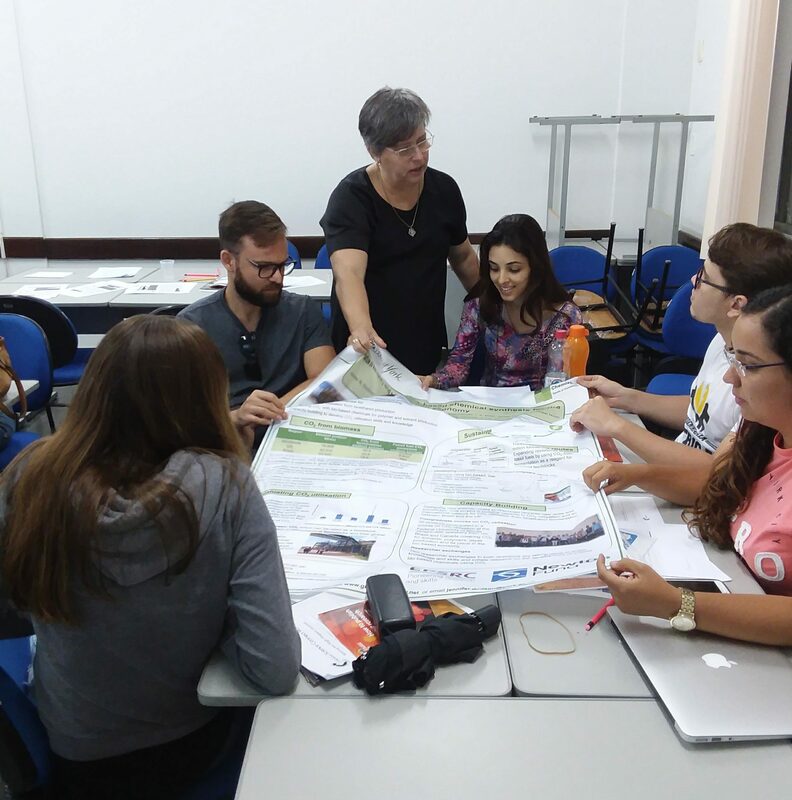 Elizabeth Magalhaes shows students at UFES an example of a fabric poster. How do Open Access mandates affect you? If you have NIH funding, you’re probably aware of the requirement that you deposit the author version of your manuscript in PubMed Central (PMC) within 12 months of publication. But did you know that the other U.S. funding agencies have followed suit? In 2013, the Office of Science & Technology Policy issued a memo entitled “Expanding Public Access to the Results of Federally Funded Research”, which mandated that any U.S. funding agency with >$100 million R&D budget create a plan to make the resulting publications and data freely available to the public. Since then, the agencies have crafted bespoke public access policies with different requirements. Some (e.g., EPA, FDA) have chosen to piggyback off of NIH’s PMC, others (e.g., US DOE, USDA) have chosen to create their own repositories, but there are some who have decided to partner with the publishing industry to fulfil the mandates. Subsequent to the memo, a partnership of scholarly publishers created CHORUS to make the required content publicly available at no additional cost to the agencies. 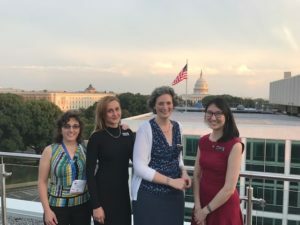 For CHORUS agency partners, including NSF, US DOE, US DOD, Smithsonian Institution, USGS and ODNI, CHORUS leverages existing infrastructure to enable sustainable, cost-effective, and transparent public access to content reporting on funded research. By integrating services and open APIs, CHORUS optimizes funder identification, content and data discovery, long-term accessibility, compliance monitoring, and dashboard reporting. RSC has been supporting CHORUS since its inception, and last year, we decided to become a full member to help our authors comply with their mandates. We have been depositing our authors’ NIH-funded manuscripts into PMC for years, so this was a natural extension of our commitment to make our author and reader experience smooth. We are now fully integrated with the CHORUS system, so expect to start seeing author versions of funded manuscripts appear on our website next year once their 12-month embargoes expire. Congratulations to our Board members! Green Chemistry Associate Editor C.J. Li of McGill University received the Alfred Bader Award recognizing excellence in organic chemistry research. 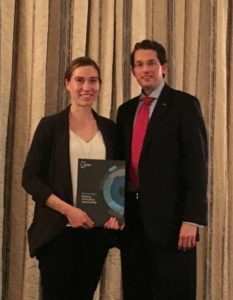 Catalysis Science & Technology Associate Editor Jen Love of UBC won the IntelliSyn Pharma Research Excellence Award for a distinguished contribution to medicinal or biophysical chemistry. Analytical Methods Associate Editor Juewen Liu of University of Waterloo received the W.A.E. McBryde Medal, awarded to an early career researcher who has made achievements in pure or applied analytical chemistry. And finally, we also wanted to highlight some of our other board members’ recent achievements. Chemical Science Associate Editor Kit Cummins of MIT received the ACS Pauling Medal for “unparalleled synthetic and mechanistic studies of early transition metal complexes”. 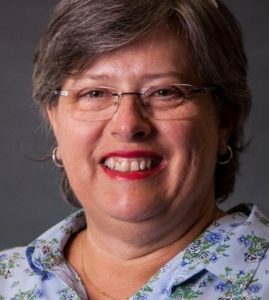 Professor Cummins has been with the journal since its inception in 2010 and has been a strong advocate for its transition to open access in 2015. Chemical Science Associate Editor Mircea Dinca of MIT received the ACS Award in Pure Chemistry. Molecular Systems Design & Engineering Board Chair Juan de Pablo of the University of Chicago was awarded the Polymer Physics Prize from APS. Polymer Chemistry Editorial Board member Heather Maynard of UCLA received an Arthur C. Cope Scholar Award. Polymer Chemistry Editorial Board member Jeremiah Johnson of MIT shared the Nobel Laureate Signature Award for Graduate Education in Chemistry with his student Aleksandr Zhukhovitskiy. Journal of Materials Chemistry C Associate Editor Federico Rosei of INRS (Canada) was elected Fellow of the Optical Society. Organic Chemistry Frontiers Editorial Board member Geoffrey Coates of Cornell University has been elected a National Academy of Inventors Fellow. Nanoscale Associate Editor Xiao Cheng Zeng of University of Nebraska visited our office in Cambridge to be presented with his Royal Society of Chemistry Surfaces and Interfaces Award. Nanoscale Associate Editor Yamuna Krishnan of University of Chicago received the Infosys Science Foundation Award in Physical Sciences. Professor Krishnan was interviewed about her award. MedChemComm Associate Editor Sylvie Garneau-Tsodikova of University of Kentucky was named a AAAS Leshner Fellow. Analytical Methods Editor-in-Chief Scott Martin of Saint Louis University received the AES Midcareer Award at SciX. CrystEngComm Associate Editor Christer Aakeröy was presented with the 2017 Midwest Award at the ACS Midwest Regional Meeting. Please let us know if we missed anyone! Last year, our Analytical Methods Editorial Board member Jim Luong invited us to contribute a congratulatory letter for the program book of WesTEC, an internal Dow Canada conference. Last year was the 25th Jubilee celebration of the conference, and the RSC President Robert Parker co-signed a letter with the President of the Canadian Society for Chemistry that appeared in the front of the program, alongside letters from Dow VIPs. We were thrilled to be invited by Jim again to contribute a congratulatory letter in 2017, and we also sponsored Best Poster and Best Lecture prizes. The conference took place on October 19th and we wanted to say congratulations to the two winners, Ms Morgan Tien (Best Lecture) and Ms Karina Singh (Best Poster)! We should also say congratulations to the Canadian Society for Chemistry on the 100th anniversary of their conference this year, and of course to Canada itself on its 150th anniversary! In honor of these two milestones, we compiled a special collection to celebrate Canadian science. Enjoy! The University of California Chemical Symposium (UCCS) is a three-day conference that brings together graduate students and postdocs from all ten UC campuses for a weekend of poster presentations and talks, career and professional development, and social activities. It is organized by students, for students. Our North American office has been proud to support this event from its foundation through our community development and leadership training initiatives for students and postdocs. Professor Seth Cohen from the University of California, San Diego, is the founder and faculty mentor for UCCS, as well as a member of the Editorial Board of our journal ChemSocRev. We talked to Seth to learn more about how the UCCS came about and where it’s going. Q: This is going to be the third annual UC Chemical Symposium – what prompted or inspired the start of the UCCS program? A: The program was inspired by two events. The first was the beginning of a series of annual meetings for the Chairs of the Chemistry Departments across the UC system (which itself was inspired by a conversation with Prof. Bill Tolman, who told me about similar Chairs’ meetings at Big-10 schools). I found these Chairs’ meetings useful and it sparked the idea of a student/postdoc symposium. The second event, was a conversation with Katie Dryden-Holt of the RSC. She was looking to enhance membership in the US, and the UC symposium seemed like a good opportunity for her to recruit RSC members across the UC campuses. Q: What is your role in the program and how has it changed over time? A: I initiated the idea and recruited the first organizing committee (with substantial help from the RSC). These days, I am more just the institutional knowledge (from year-to-year) and faculty mentor to bounce ideas off of. The organizing committee really does the heavy lifting. In the future, I hope the symposium becomes largely self-sufficient, to the point I am not really needed anymore. I really want this to be something that the students own and sustain. Q: Did you have anything like this when you were a grad student or postdoc? A: No. The closest was the GRS: Bioinorganic Chemistry. This was one of the first GRS meetings and it was my favorite meeting. I made many close friends and I loved that it was student run and organized. That was a large part of the inspiration for the structure of the UCCS. Q: The low registration fee of $259 covers all of the program activities, meals, accommodations and more. How is the organizing team able to make the cost so affordable? Fundraising. The one thing about this conference I was fairly confident in was that we would be able to initiate a robust fundraising effort. Organizations love to support students. The mission of UC is to support students. I reasoned that most UC Chemistry Departments, Dean’s offices, and other organizations could each give some support, which collectively, would result in a lot of funds to make the symposium quite inexpensive. Additional support from the RSC, ACS, publishers, and most recently the NSF has further helped make this symposium readily accessible to all students and postdocs. Q: What is the most challenging part of having ten campuses involved? Q: As an Editorial Board member for ChemSocRev, you also initiated the Primer collection of tutorial reviews to help new grad students get up to speed with all the most exciting research and help figure out their own research interests for graduate school. Why is education and training the next generation so important to you? A: The future success of the chemical sciences and the solutions it will bring to society in the fields of energy, the environment, health, and technology are in the hands of the next generation. It is important to me that the young scientists I work with feel motivated, supported, and excited to pursue cutting-edge research in the chemical sciences or whatever field their career takes them. Q: Would other regions benefit from having a program like this, or is it unique to UC? A: Absolutely! I’d love to see the idea come full circle, back to the Big-10 (where Bill Tolman is) and see them do something similar. I think this could be done regionally all over the country and the world. Q: What do you see, or hope to see, the future holding for UCCS? A: I think the autonomy is key. I love being involved, but to make it in the long term, it needs to become fully independent of me as a single faculty mentor. Personally, I think the size and the format are really good. I’d like to see it spread to other universities. For the UCCS specifically, I’d like to see it alternate between a SoCal and NorCal location (we’ve looked at Lake Tahoe), to make it more equitable travel-wise for the NorCal UC campuses. Q: What’s your favorite thing about the UCCS? That it brings the students together. I think that is so important – to meet your peers from across the state and share experiences. Jennifer Griffiths (Editorial Development Manager, Americas) received her Ph.D. in bioorganic chemistry from Duke University before moving into publishing. She started with the RSC five years ago as our first publishing representative in the US. She currently manages the team that develops our publishing activities in North and South America. Before joining the RSC, she was a Managing Editor at the ACS for Analytical Chemistry and several other journals. Jen has a wide variety of interests outside of work, including knitting and needlework, running, Pilates and has recently started volunteer work teaching English as a second language. 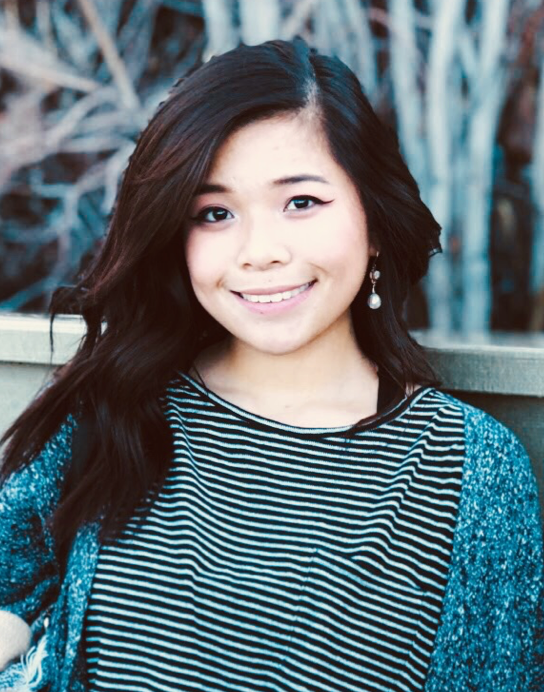 Jenny Lee (Assistant Editorial Development Manager, North America) joined the RSC in 2014 after completing her Ph.D. at Iowa State University in synthetic organic chemistry with sustainable applications. Jenny enjoys meeting researchers and discovering opportunities to share knowledge and support research advances throughout North America. She looks forward to interesting conversations with the researcher and scholarly communication community, most recently through a Society for Scholarly Publishing Fellowship. If she’s not at a conference or visiting institutions, Jenny can be found learning new things at events across the city, doing yoga, or cooking experimentally in her kitchen “lab”. Marika Wieliczko (Assistant Editorial Development Manager, North America) joined the RSC in 2017 after finishing her Ph.D. in inorganic chemistry at Emory University. She always felt that the best part of science and research is sharing it with the rest of the world so jumped at the chance to move into publishing to help others share their work. With a non-profit like the RSC she is able to combine this love of science with a passion for community service! In this position, she most enjoys learning about all the new research that she never had a chance to pursue, getting to know the scientists who inspired her, and helping young people gain the experience and skills they need to become the next generation of global leaders. In her free time, Marika enjoys athletic activities, especially running, tennis, and horseback riding, learning, watching, and playing games, planning fun activities for friends and family, listening to podcasts and reading about movies and books instead of watching and reading them. Rebecca Trager became the US Correspondent for the RSC’s Chemistry World magazine in September 2014 after writing for the magazine on a freelance basis since 2007. She tracks and covers all news coming out of North America that impacts the field of chemistry, including policy developments. With a background in policy, and a passion for journalism, she has found her niche covering the world of science policy since 1997. Rebecca’s interest was sparked after spending summers during college as a press intern for the US National Institutes of Health. Before joining Chemistry World, she was the US Editor for Research Europe, reporting on the White House, as well as government departments and US agencies. She is also the former managing editor of The Blue Sheet, an Elsevier biomedical research and health policy publication. She studied philosophy and political theory at Haverford College in Pennsylvania. Elizabeth Magalhaes is the RSC Manager for Brazil and Latin America. She started with the RSC almost six years ago as our representative in the region. Beth received her Ph.D. in analytical-inorganic chemistry from University of Campinas-UNICAMP. She now manages the RSC office in São Paulo working with the community to develop skills and promote knowledge in Brazil and South America. Before joining the RSC, she worked as Editorial Manager at the Brazilian Chemical Society for Journal of the Brazilian Chemical Society (JBCS). Beth’s interests outside of work range from Formula 1 to Football in sports. She enjoys cooking and collecting stones from places she visited. Look for further updates soon!